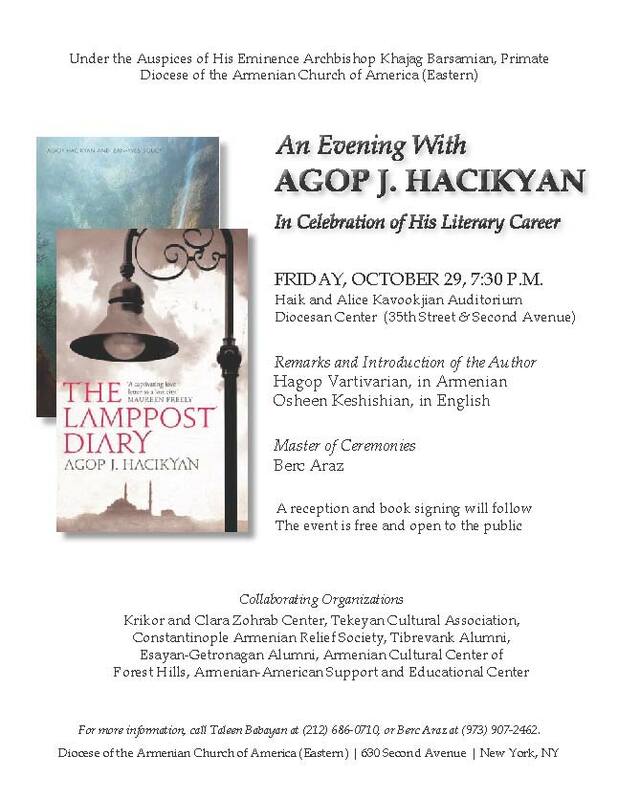 An event celebrating author Agop J. Hacikyan’s literary career will take place on Friday, October 29 at 7:30 pm in Kavookjian Hall of the Diocesan Complex, located at 35th Street and 2nd Avenue in New York. The program will include remarks and introduction of the author by Hagop Vartivarian (Armenian) and Osheen Keshishian (English). Master of Ceremonies for the evening will be Berc Araz. Agop Hacikyan is a Canadian-Armenian academic and writer. He is Professor Emeritus of English at the Royal Military College of Canada and the author of the international best-seller A Summer Without Dawn and his most recent publication, The Lamppost Diary. A reception and book signing will follow the program. This event is free and open to the public. For more information, please contact Taleen Babayan at 212.686.0710.